So, you got talked into cooking with a dutch oven, eh? Well, it's about time! 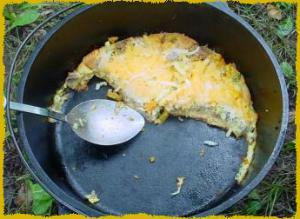 Dutch oven cooking is one of the most splendid activities on a camping trip. Transforming raw materials into an aromatic, mouth-watering meal or dessert is as much art as science. Just the looks of anticipation on everyone's faces when you lift the lid on your cast-iron dutch oven and let some of the smells escape is worth the extra work of packing this heavy piece of gear. You can buy my signed Cookbook or surf my website. 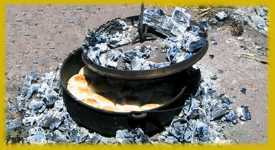 On these pages, I've jotted down all the advice I can think of to help you choose a good dutch oven, get it ready, keep it in good shape, and use it to create magnificent meals. My dutch oven recipes give you a selection of dishes to prepare for breakfast, dinner, or dessert so find one that sounds good and give it a try when you want to go for something new. Most of the dutch oven cooking I do is on camping trips. But, using a dutch oven at home is also very popular since the food gets cooked at a constant, all-around temperature. There's nothing better than a wonderful dutch oven meal served for friends at home. If you are just starting with dutch ovens, you should read through this site like a book. Or, use the navigation on the left to hop to any page that interests you. Thank you so much for your page, it has been extremely useful. I fell in love with Dutch Oven cooking over scouting trips and now with my youngest's Pack I'm trying to veer them away from foil packets and hot dogs (how boring). We will be using a few of your recipes this month on our Pack's trip to Sand Dunes NP. You've also inspired me not to be intimidated by rusty cast iron. I found a 12" skillet at Goodwill for a few bucks and I'm using this afternoon to restore it. I just wanted to drop a line and say how much I enjoy your site and thank you! P.S. Have you seen the new Webelos requirement Cast Iron Chef? it's a great intro to getting them away from the usual boring Cub Grub. @Elizabeth - Super! I'm glad you're helping the scouts expand their culinary horizons. Yes, I like the new Cub Scout cooking emphasis, and the additional camping expectations. I hope they don't cause too much concern for Packs that have not done much in the past. If you get any good pictures of the meals you make, send an email and I can add them to the recipe pages. Make a lattice work of bacon strips in the bottom of your cast iron skillet or dutch oven. Cook the bacon to the half way point, do not drain the grease, then add your cornbread mixture over the bacon and cook until done. The cook must have the first slice as it will disappear quickly! Just completed the scout cast iron chef with your recipes. Burgers, beans and biscuits were a hit as well as Dutch oven pizza and short corn. Would like to send you the pictures. Send us an email link. New way of cooking was super. I got into the dutch ovens because of scouting. I now own 3 (2-12s and a 14"). I go with my oldest for boy scouts and am always asked or volunteer to cook. Every meal on camp outs is done in the DO and now as Cubmaster for my younger boys, its going to be great. I've printed and shared most of your recipes. We even have our own DO society in delaware. The Dutch Oveners of Delaware Society (DOODS). We love your recipe's. Our friend turned us on to your site. The chill Mac is so good. You are awsom. Thank you for sharing. Just made your Hawaiian Steak Strips Dutch Oven Recipe. Something must be left out! Nothing Hawaiian about that! Made about 10 of your recipes using DO, they were great. If something was left, could you correct, Thank You. Great recipes and good information. I do prefer the lifting power of a full grip, ringed lifter to the insure chicken foot lifter though. Check one out at MyOutfitter.Com Happy Cooking. Great recipes! Haven't found a bad one yet. @Scott - Have you tried to just print a page from your web browser instead of copying and pasting? I think you'll find that just the content gets printed and not the ads and navigation. These look amazing! Question about the German pancake recipe: we made it in my oven at home and it turned out great. My son is going to try to make it on a scout cookout this weekend - should he use the Dutch oven lid to cover it or leave it open to bake? @Amy - The lid should always be on the dutch oven when <B>Baking</B> since most of the coals are placed on the lid, and the lid keeps in moisture. If you are frying, stewing, or simmering, then the lid is not needed since all heat is under the dutch oven. Thanks for sharing your recipes. We do a lot of Dutch oven cooking with our Cub Scout Pack and our boys love cooking dinner at our campouts. Last campout we had 6 dutches going with Cowboy Stew, Witches Brew, Chili Mac and Chicken Pot Pie. Also made 4 cobblers for dessert. Some tips for others: most recipes that say 6 servings will feed 8 if you have more kids than adults. Cobblers feed about 10-12. If recipes call for potatoes, recommend pre cooking them some. We found the recipes that had potatoes took longer than times in recipes. Just received your cookbook. Most cookbooks have 10-20% of recipes one will actually eat. This one has 100%! The problem was deciding which one to try first. Going with the Zingy Pork Chops this weekend. Then on to another! Thank you. My oven has the patina that is flaking into my food. Should I try to remove it and how? @Denise - Yes, if it's flaking off, you should reseason your dutch oven. Start on this page and put in some effort and your dutch oven will be good as new. I guess maybe this isn't a "dutch oven" question. We have what I think you are calling a bean pot that was my in-law's. It has a glass lid. Assuming I can't use this IN the fire, what CAN I use it for? Will it work hanging over a fire or on a grill over the fire? Or is that too much for the glass and I should reserve it for indoor or camp stove cooking? @Wendy - I wouldn't use any glass items cooking outdoors. It's just too easy to break them. I would keep that item for use indoors. This is a great site. Thanks for having it. Awesome recipes, just wondering how to send pictures of our dutch oven food to you so you can use them for some of the recipes, thanks. I do look forward to pictures of meals all you folks have made, especially before they get devoured! In general, can I cut a recipe in half from a 4 quart (10") to use in a 2 quart (8") Dutch oven? @John - Your 2qt is probably 8inx3in and your 4qt is 10inx3.5in - so the extra volume in the 10inch is gained by making it deeper. This will not work out to even cooking of solid foods like breads, desserts, casseroles.